Youbie Obie, a sculpture in cor-ten steel by J. Pindyck Miller, class of 1960, was installed on campus adjacent to Coffrin Hall and Le Chateau. MIDDLEBURY, Vt. -- The College's public art collection has an impressive new piece with the installation of Youbie Obie by J. Pindyck Miller ’60. Miller's cor-ten steel structure is 15-1/2 feet tall by 15-1/2 feet wide, forming something of a gateway to the northern area of campus bound by Le Chateau, Atwater Suites, and Coffrin Hall. The sculpture was installed at the end of the summer, following the conclusion of the Language Schools. The sculpture was donated to the College by a couple in Greenwich, Connecticut, who also funded the restoration of the metal surface, transport to Middlebury, and installation on campus. Arriving in multiple pieces in an enclosed truck, the sculpture required a crew of three metalworkers and a crane truck to assemble the final piece. Emmie Donadio, chief curator for the Middlebury College Museum of Art, says the College's Committee on Art in Public Places (CAPP) carefully considered the location of the sculpture. 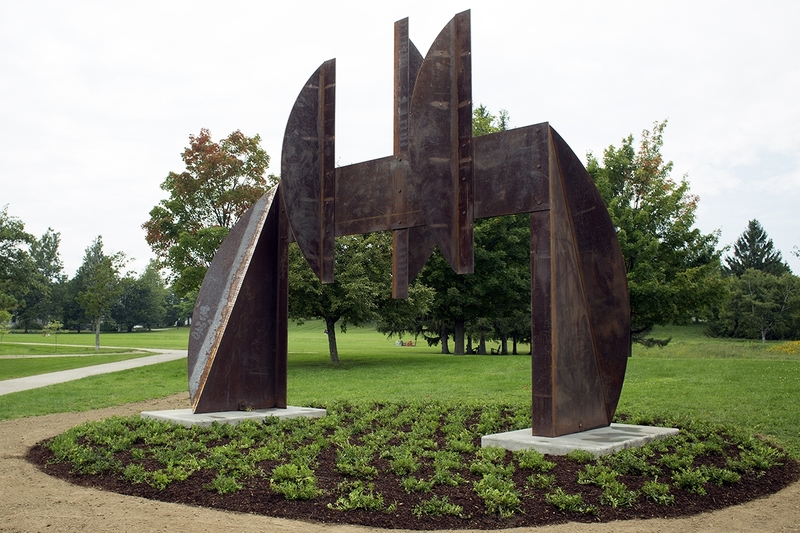 The location adjacent to Le Chateau and Coffrin Hall was selected, in part, because of its proximity to the similarly scaled sculptures, "King Kong" by Jules Olitski and "Smog" by Tony Smith. She also noted that the location is a crossroads of sorts for many students, providing multiple visual perspectives for the new artwork. "The Committee on Art in Public Places has commissioned works over the years and also been given gifts," said Donadio. "This is a great gift for our collection."